The Founding Fathers believed that the proper goal of the State was to make men and women free to develop their faculties and to pursue virtue and wisdom. Our Constitution was built around these principles, protecting civil liberties and developing a careful system of checks and balances that protected our freedom from tyranny. Naomi Wolf's latest work, The End of America: A Letter of Warning to a Young Patriot, exposes how the escalation of executive power has eroded these core values and systems, limiting Congress's ability to make laws and our courts' power to interpret them-a scenario that our Founding Fathers foresaw and warned against. Wolf outlines in this citizen call to action-which is reminiscent of Thomas Paine's revered Common Sense-the real threats to our civil liberties that exist and explains how by working together we can stop the growing threat. 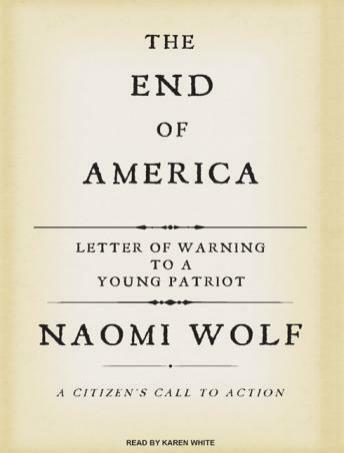 The End of America: A Letter of Warning to a Young Patriot is the centerpiece to the American Freedom Agenda, a nonpartisan organization of which Naomi Wolf is a founding board member and which asks all Americans to support a 'Freedom Pledge' to support only candidates who favor restoring the pillars of American liberty. It combines a wide host of partners, united in their belief that when it comes to the Constitution, we are neither conservative nor liberal; we are all Americans.